Benedictine Oblates are lay men or women (or diocesan priests) who are striving to live the spirit of the Rule in their own call of life. 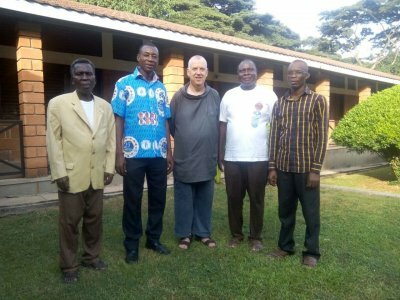 Every Oblate belongs to one particular monastic family and Kristo Buase has approximately twenty secular oblates who form part of the extended monastic family. Our first secular oblate was Br Joseph Asare. 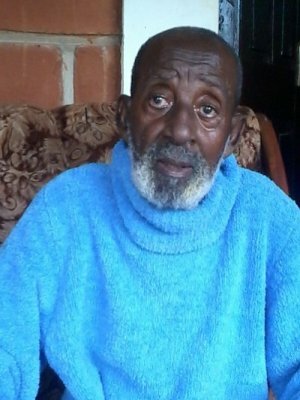 He was formerly a diocesan hermit living on the rim of the crater at Lake Bosomtwi. In 1999 he came to live at Kristo Buase. 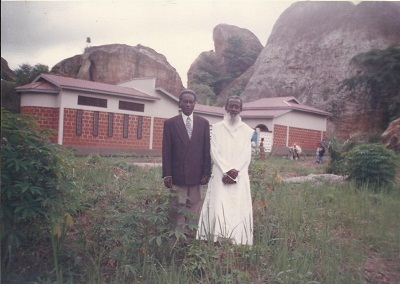 Here you see him in front of the Kristo Buase Hermitage, opened in 2004, with his friend "Coach" from Kumasi. The architect for the hermitage was Professor H. Nii Adziri Wellington, then Professor of Architecture at KNUST. Professor Wellington has agreed to be our architect for the Church and Guesthouse projects. The chapel on the left is used by the community on recollection days, and by retreat groups. Here is a more recent photo of Br Joseph. He celebrated his 90th birthday on the 21st September 2014. 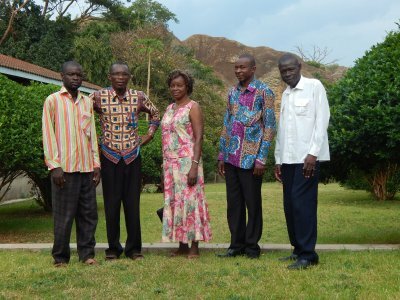 The photograph shows a group of our friends and oblates from the Techiman chapter. Pictured here: Anthony, Thomas, Gertrude, Philip and Sergius. You will notice this is a work still in process! My intention is to gradually post chapters of the Rule in this section with notes drawn from the commentaries of three Benedictine scholars: Terence Kardong, Basil Steidle and Abbot Holzherr. 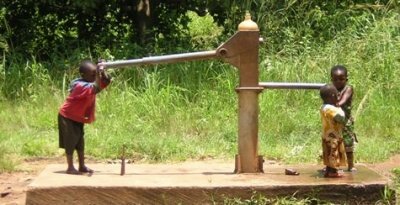 'Sir,' the woman said, 'you have no bucket and the well is deep, so where will you get "living water"?' - John 4:11. It was Fr Augustine Baker, the 17th century Welsh Benedictine, who brought the spiritual teaching of the English Mystics back into currency. His great work 'Holy Wisdom' (Sancta Sophia) draws deeply on this tradition. Abbot Cuthbert Butler of Downside, one of the major figures of the monastic revival in the 20th century, re-read 'Holy Wisdom' every Lent for more than 50 years. Julian of Norwich's "Revelations of Divine Love", written down at the end of the 14th century, were transcribed and circulated in the seventeenth century by Fr Augustine Baker's editor; Dom Serenus Cressy, OSB. There are many modern translations in print.